Daytime cherry blossoms are not the only enjoyment in Kyoto. Spectacular nighttime events are held during this special time of the year. 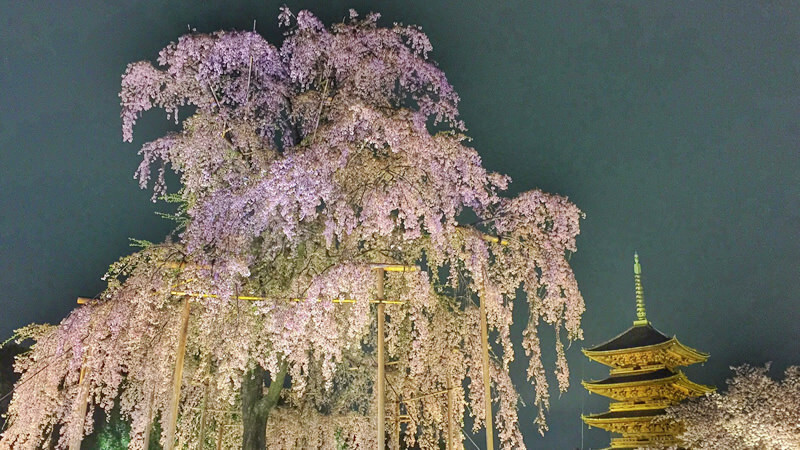 Several temples as well as attractions host illuminations to bring the spotlight onto the beautiful cherry blossoms in Kyoto. The view is different than of daytime. Try seeing the same temple you saw during daytime at night as well and see the difference. Changing faces of cherry blossom will give you a new kind of understanding of how beautiful cherry blossoms can be. 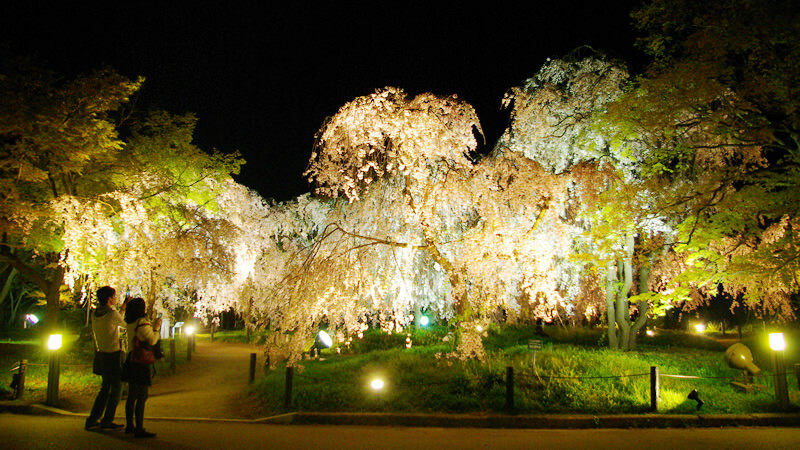 We recommend you to see the beauty of nighttime cherry blossoms through these illuminations we recommend below. Kiyomizu-dera Temple is one of the major spots in Kyoto for visitors from both within the country and abroad to visit. But they are not usually open at night. They are open after the hours only during special nighttime events. 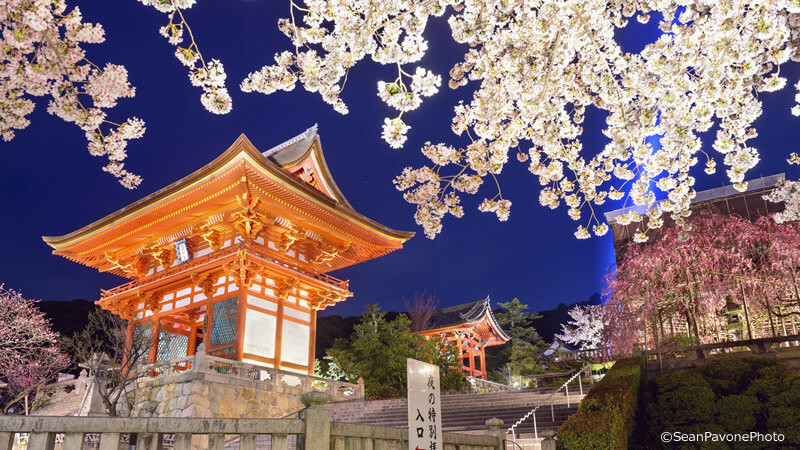 The Sharing Kyoto Nighttime Illuminations award goes to Kiyomizu-dera for the most number of cherry trees in one place. Totaling up to 1,500 trees within the premise, the view from the stage is magnificent. The reflection from the lights of the illumination and the city lights give a blue hue to the sky, something you should try to notice when up in this temple. 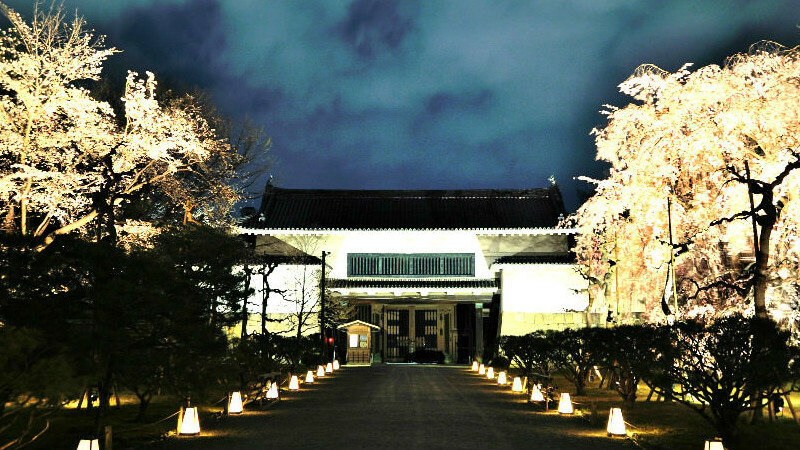 Check out another face of Nijo-jo Castle at night when the cherry blossoms are illuminated in full bloom. Around 200 cherry blossom trees and 50 different types of cherry trees bloom in the premises. Take note that entrance is free if you enter wearing a kimono! The highlight of the nighttime illumination at the Kyoto Botanical Garden has to be the 130 different types of cherry trees that are illuminated within the premises. This botanical garden is loved by the locals for its large size and ease of access. It’s a place where you can not only see cherry blossoms, but other beautiful plants as well! On the line of Arashiyama Electric Tram Railway or Keifuku Electric Railroad, there is a tunnel of cherry blossoms in between Narutaki Station and Utano Station. 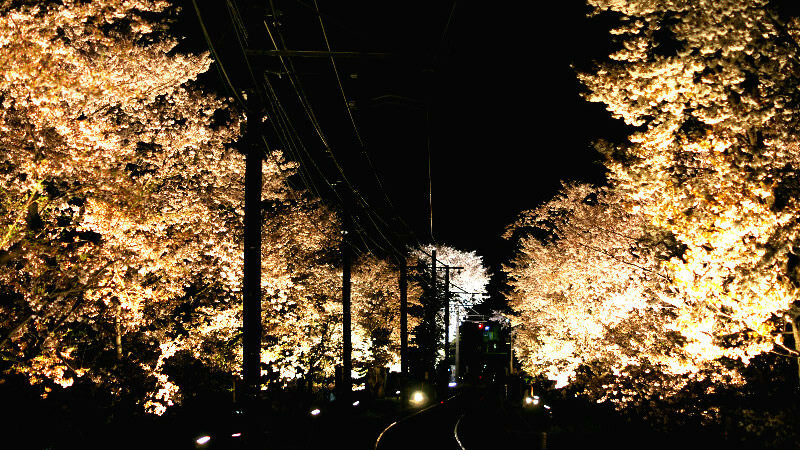 At night, the lights showcase the blossoms beautifully and the train slows its speed for the riders to enjoy the illumination. The lights inside the train will also turn off while going through the blossoms for a magical moment. To-ji is a popular spot in Kyoto to visit for its beautiful pagoda. Many people visit during the cherry blossom season to see the famous Fuji Sakura that measures 13 meters tall. About 150 Somei Yoshino cherry trees also stage the temple. To-ji is a perfect spot for taking pictures of cherry blossoms with the pagoda in the scenery.